A group of hikers were followed by a grizzly bear on Mount Norquay on Sunday but managed to escape. The trio of friends was hiking down from the top of the Mystic chair lift at Mount Norquay at about 3:00 p.m. when they spotted the adult grizzly watching them from about 100 metres away. They began backing away but the bear started walking toward them and began closing the distance. The hikers kept moving, pulling along their dog that was barking at the bear which continued to follow them for about 20 minutes. They let the dog loose and it drew the bear off while the hikers ran away, but when the dog returned, the bear came back too. They continued to make their way to the parking lot with the bear still following them and met up with Parks Canada staff that let them into their truck. That is when they learned that the bear that followed them has caused trouble before. “They told us it was bear 148, the same bear that chased the lady with the two dogs two weeks ago,” he said. The hikers said were all shaken after the close call but said they bought bear spray on Monday and then hiked Tunnel Mountain just to try to get past their fear. 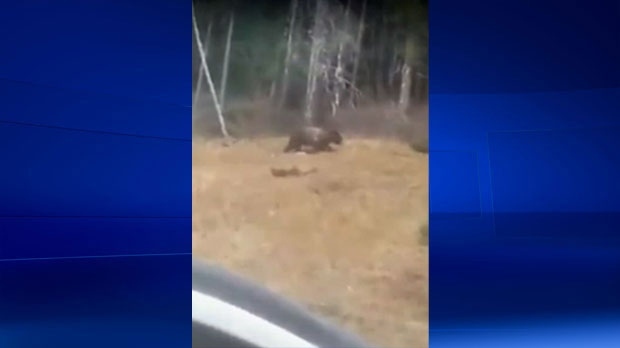 Three friends were chased by a grizzly bear on Mount Norquay on Sunday.